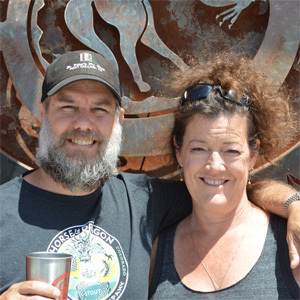 Carol and Tim Cochran are the Co-owners of Horse & Dragon Brewing Company. Follow them on Facebook, Twitter, Instagram and YouTube and learn more at horseanddragonbrewing.com. We make great, fresh, tasty craft beer on a small scale and work to build community in Colorado. We love good craft beer, and we feel that the world definitely needs more products that enable people to meet, gather, connect, and communicate! We are working to build our company to the point that it can support our team to live, work, and contribute in Colorado. We’re also devoting time and effort to helping smaller craft breweries (ourselves included) find achievable ways to operate in environmentally responsible ways. So many folks who’ve gone before us (both in craft brewing and in life) have set an example of being net givers. We’ve tried to follow this in our personal lives, and the company is an extension of that. All of those people and companies continue to remind us of the obligation we have to pay their example forward. I’d cite in particular my grandfather who always said that if you travel a rough path, make sure you build a bridge so those following after you have it a bit easier. We’re acutely aware of the bridges that were built for us and are trying to build some for future companies. Our dream is to responsibly produce a product that contributes to peoples’ ability to connect to each other and to grow to the point where our employees can live in, work in, and be contributing residents of northern Colorado. This, for us, means enabling each of our employees to have a stable roof over their heads in the crazy housing market that is Fort Collins right now, and encouraging them to become involved in supporting organizations that resonate with their values and are working in our communities. We’re still pretty far from some of these goals, but hope to reach them in time. We need several more years of hard work and excellent beers, and many Coloradoans who are willing to buy them! Working on finding the right fit for our team is always the hardest thing. Once you have the right people on your team, who, for one reason or another, believe in what the company is doing and who work hard and honestly for all of their colleagues, the rest falls together. For entrepreneurs looking to make an impact, we’d say: don’t wait until you’re financially where you want your company to be before you invest in your community (or whatever else you’re passionate about). “Baking it into your DNA” means it’s there from birth. Do it now! It might take longer to get to where you don’t worry daily about financials, but every day will be better because your company and your employees are awesome parts of the bigger things in which you believe. We were determined that Horse & Dragon would contribute (with time, money, and product) to the organizations that make our community strong, even during our start-up years, and that is what has provided major rays of light to some very long days! Anyone can support our cause by being willing to buy and enjoy craft beer made by small, independent companies. We believe the taste is worth paying for, but we also believe the rippling support small companies offer communities is vital. Please know that paying a premium for delicious craft beer in many cases means you’re also paying a small portion of someone’s health care insurance, someone’s mortgage, and someone’s retirement fund, as well as enabling a company to help communities be more connected.